Home from the Shore Human, Beware! Good Show Sir’s Art Direction: Well here’s my Nephew, a silver jump suit and a box of mangoes. Now just head out to that field and get me a picture. I’m sure whatever you come up with will be just fine. My favourite thing about the book. Weird Cover – Written by the book store owner! Any horny handed son of the soil will tell you the crop of 1979 Gary Numans has not been bountiful this year, the weather being what it is. The mafia are just getting lazier and lazier. They haven’t even tried to bury that body! This would just about work as the cover of THE MAN WHO FELL TO EARTH, but is better suited as an illustration of the perils of growing potatoes. Why did they rake the dirt across his shoulder? You say potato, I say… Arrgh! Although for a moment I thought that this was a novelisation of the acclaimed Danish police-and-knitwear procedural by a new Scandinavian writer, Thing Kate Wilhelm. Is he….smiling? And, if so, the dirt across his mid-section, coupled with his left hand position, makes this cover a bit….odd. Hmm, maybe he’s growing in the ground, INVASION OF THE BODY SNATCHERS-style. Obviously the Killing Thing is quite the agronomist … it knows astronauts are a good source of nitrates. 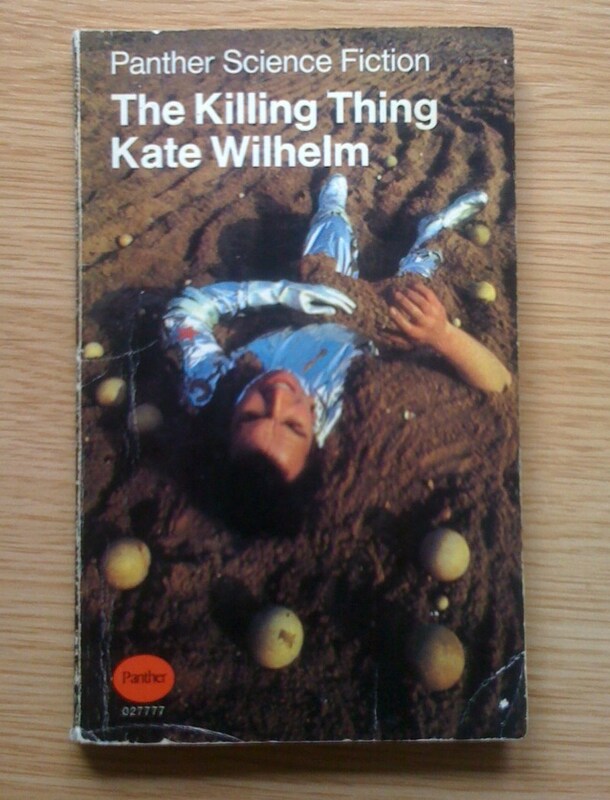 “Thing Kate Wilhelm” remains my favourite Danish crime-writer, and ‘The Killing’ is her masterpiece. The little moon and star on his non-naked arm just make this for me. Looks like he’s halfway through making a dirt angel. I think we have stumbled upon The Genesis Moment for those “get rid of cable” DIRECTV commercials. Wait… that bare arm is a zombie dragging that space suited dude underground!! Ah I think someone took “Pomme de terre” literally… apples of the dirt. Panther Science Fiction: Look for the Logo!! Oh, wait, we don’t have a logo. OK, just look for the books with the weird photographs for covers! It is oh so tempting to make a pun on “balls”… but I fear a diving 13-ton weight dropping from the sky onto my head. The balls look like mini Jupiters. Maybe he’s being crushed by the gravitational forces imposed by the mini Jupiters….or it could be just gas. So it’s not just “Star King Jack Vance” but also “The Killing Thing Kate Wilhelm” who wrote “Panther Science Fiction”? Not the kind of sci-fi/fantasy book covers I was expecting. Death by automatic tennis ball launcher must be horrible. Whatever these things may be, they can be cultivated by seed or by cuttings. I’m trying to imagine what this photo shoot was like. I don’t care if it is faithful to the book or not but he really should be dressed as a clown. When no one was looking, Scott Bakula stole eleven mangoes. He stole 11 mangoes. That’s as many as 1.1 tens. And that’s terrible. BREAKING: Trump accuses cover model of lying. He’s not so much ‘the man who fell to earth’ as he is ‘the man who threw a hissy fit while planting potatoes’. @DSWBT: That’s not Scott Bakula. It’s John Barrowman. @GSS Whovian: Good show, ma’am! 🙂 But not enough forehead, I’m afraid. @GSS ex-noob: the thought of John Barrowman Quantum Leaping into the bodies of people in 1950s midwest America and making them get their willies out and belt out show-tunes is almost enough for me to wish Donald Belisarius would revive the series. @Tat: I’d damn well tune in to that, and probably buy the DVDs.